I have been living abroad in the small town of Oestrich-Winkel, Germany for three months now, and as fast as it has gone it feels like forever ago that I was on my Singapore Airlines from JFK to Frankfurt, not quite sure what to expect when I landed in Europe.Â At first, the culture shock was even more enormous than I could have imagined.Â As expected, accustoming to language has been a challenge. While the old adage that â€˜everyone in Europe speaks Englishâ€™ may hold true for the big international cities on the continent, it certainly does not hold true for this remote, ten thousand person town of Oestrich-Winkel. Additionally, adjusting to the German way of life â€“ such as living without a freezer, minimizing use of heating, and adhering to the countryâ€™s five bin recycling system â€“ was highly inconvenient at first. However, I have become more than accustomed to living as the Germans do (though my love for pork has not caught up to thereâ€™s yet). As far learning the German language, I have been able to pick up on a semi-impressive amount of vocabulary in just a two month span (mostly thanks to being enrolled in a course); alas, I am not able to have a conversation with someone past asking someone if he/she can speak English. Overall, Oestrich-Winkelâ€™s size can make life rather â€˜underwhelmingâ€™ for the townâ€™s couple hundred international students. Though the schoolâ€™s website claims Frankfurt is just a short trip away, this is only true in distance. Realistically, exchange students like myself have to take the hour and a half, 10.50â‚¬ one way train to get to Frankfurt (for the traveling folks, the Main airport is just 7.40â‚¬ to reach, while the Ryan Air hub Frankfurt Hahn is a staggering 14.40â‚¬). Thus far, my impression of Oestrich-Winkel is that it is a quaint bedroom community on the Rhine, whose natives choose to commute to the nearby cities of Frankfurt, Wiesbaden and Mainz so they can have a rural way of life at home in Oestrich-Winkel.Â As a result, the small town has the bare minimums in the ways of food and entertainment (though does manage to support three grocery stores). While Germany has perhaps the most extensive rail network in the world, Oestrich-Winkel only lies on a single rail line running east/west, limiting the ability for the international students to do much adventuring outside the Rhinegau to off-days and those with large budgets. On a more positive note, Oestrich-Winkel is about as safe of a place as you can find in Europe, and my cost of living is fairly lower than living in a major European city. At the same time, seeing friends abroad in London, Dublin, Seville, Milan and Athens always busy with various cultural activities can often leave something to be desired in this sleepy town. On a non-business note, perhaps the largest asset the EBS can offer exchange students are the ability to come together with other exchange students like themselves. 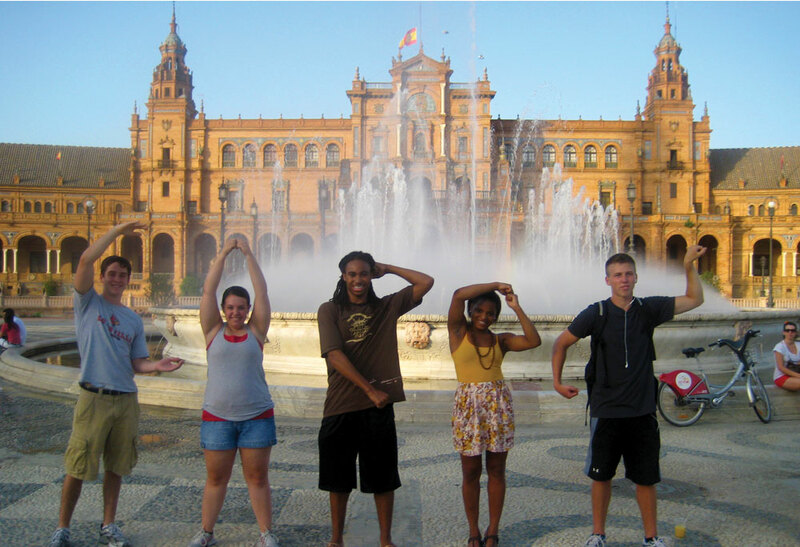 Though anyone in an exchange program will meet people from all six continents, Oestrich-Winkelâ€™s remoteness along with none of the â€˜Tauschiesâ€™ speaking German as a first language has naturally inspired an extremely close knit community of international students who do all their adventuring around the area together. For myself, I have particularly become very good friends with my roommates from Ireland, France, and Latvia in just a few short months, and who knows if we would be so close if we had a city of possibilities to escape to. Nevertheless, I do know that had it not been for other foreign students like myself, I would not look as fondly back on this semester as I will on my flight back home at the end of May. Despite Oestrich-Winkel being fairly remote, it is indeed very easy to travel around the continent once you hit Wiesbaden Hauptbahnhof at the end of the train line running east. From here, one can catch a train to either Frankfurt Hbf or Frankfurt Main, two of the continentâ€™s busiest centers for train and airport transportation respectively. For me, the concentration of such distinct cultures within Europe has always been the largest draw for me to study abroad here versus any other continent in the world, and while not always the most convenient (it is must easier to get out of Oestrich-Winkel than it is to get back) it is certainly one of the best regions in Europe to do mass traveling. Outside of Frankfurt, I have been fortunate enough to be able to visit Amsterdam, Prague, Seville and Dublin (of which I will write more about when I get the chance), with future trips planned for London, Heidelberg, Paris, Italy, and Zurich. With so much travelling and school work left to be done, it is hard to imagine that I will be back in America in just seven short weeks. This semester has been one crazy ride through all the school work, traveling, my computer breaking halfway through, and overall adjusting to a whole other language and way of life in the middle of nowhere. Nevertheless, it has already been a very memorable ride, and I plan on doing the best to enjoy the rest of the time I have here in Oestrich-Winkel and Europe.